According to a recent survey, teeth whitening is one of the most requested cosmetic treatments at the dentist office. With the advent of new at-home techniques, teeth whitening is more popular than ever and relied on as a quick way to boost confidence. Your dentist can perform a professional tooth-whitening treatment, which involves applying strong agents to the teeth while also taking special precautions to protect the gums and rest of your mouth (the procedure typically involves gels with buffers that protect teeth from damage). 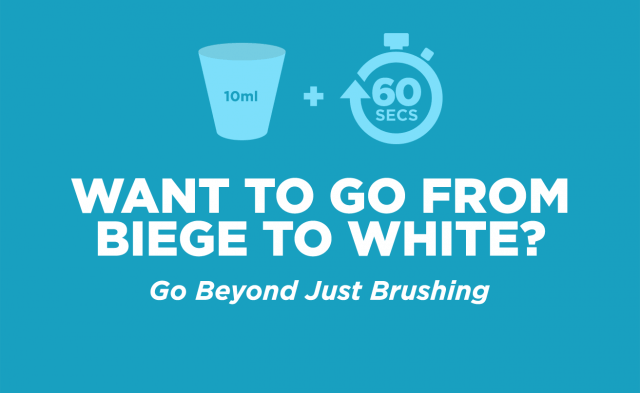 These treatments significantly brighten teeth, making them up to 10 shades whiter. But they only whiten the front eight teeth. Do-it-yourself whiteners are readily available at any drugstore, and have become popular and affordable alternatives to the professional treatments. Some options to look for include: whitening mouthwash, like LISTERINE®, whitening toothpaste, whitening strips, paint-on tooth gel, mouth trays with gel and whitening gum. These at-home whitening methods, used without dentist supervision, are considered generally safe by cosmetic dentistry associations. But if you have a diagnosed (or suspected) problem or condition with your gums, teeth or mouth, you should consult your dentist first before using DIY teeth whitening techniques. Also be sure to follow the package instructions, and if you experience any side effects, such as tooth sensitivity, discuss this with your dentist.